A parabolic mirror reflects the sun’s rays on a matt black pot at the focal point inside the mirror. Burns and screens are so easy to avoid. The cooker can be used one hour after sunrise to one hour before sunset. 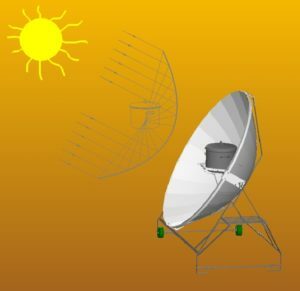 To follow the sun the solar cooker is moved by simple hand grips every 15 to 20 minutes. • Zum Umrühren wird der Reflektor so geschwenkt, dass der Topf im Schatten steht. 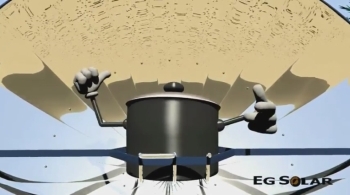 The solar cookers are designed in such a way that they can be produced with the simplest tools on site. For the serial production of the Solarkocher SK14 (band steel frame), we have assembled a factory equipment with hand-operated machines, which are also available from us.